Martin Luther was born in Germany on November 10, 1483. Like many of his day, he was a devout Roman Catholic and was taught to respect the Catholic Church, respect the pope, and respect his priests—and he did. After all, these men were in charge of his spiritual life. Luther was taught to know God only as an angry Judge who hated sinners. Luther was a sinner; he knew that. He felt guilty over the bad things he had done. Fearful that he would never be good enough to enter heaven, Luther entered a monastery where he could study God’s Word and devote himself to doing many good works. 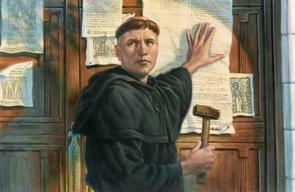 What are the 95 Theses? Luther had never studied the Bible before. The printing press had not been invented yet, so Bibles were hand-copied. This made them rare and expensive. While in the monastery, Luther had access to a Bible and he studied God’s Word. In fact, he received his doctorate degree in theology (the study of God). His studies taught him to go “back to the source,” that is, go back to God’s Word to learn about God. “The righteous will live by faith” (Romans 1:17). The Bible teaches that only Jesus makes people morally “right” before God; only Jesus’ death on the cross removes sin. The Bible contradicted what Luther had been taught for so long—and he knew the Bible was correct. So, Luther put his concerns down in writing. He wrote 95 Theses (points of debate) and on October 31, 1517, nailed them to the doors of a church (church doors were the community bulletin boards of the day). The next day would be November 1st, a day where masses of faithful worshipers would gather for All Saints Day services at their local congregation. He intended to discuss his concerns with church leaders with the hope that the two sides could reach an agreement. At first, Luther believed that many Catholic church leaders had little idea what false teachings existed in their church. In the years that followed, Luther quickly learned that his Catholic church leaders had willingly strayed from Scripture and were content in following the things their minds made up. Luther tried to reform his church (that is, shifting Catholic church from human teaching and back to God’s teaching). Here I stand, I can do no other, so help me God. Amen." Is the Reformation still important? Martin Luther did not try to start a new church; he wanted a church that relied only on the Bible which teaches us about God’s undeserved love. In the years which followed, the church which elevated God’s Word become known as the “Lutheran church.” Does this mean Lutheran churches worship Luther? No. Being “Lutheran” means people follow Luther’s approach to the Bible: Let God speak—and God alone. Let no human mind create new teachings. Let no human being reinterpret God's Word in order to make it say what the mind wants to believe. The Bible teaches Jesus removed our debt of sin. This might sound too good to be true. Perhaps we feel we must earn God's love by living a moral life. Maybe we think we must choose to make God's forgiveness ours. Yet, the Bible teaches that we can do nothing because God has already done everything. Being "Lutheran" means that we hold to the scriptural position that Martin Luther did. The Bible teaches that we are saved by grace (God’s undeserved love)—and not by what we do. Faith trusts that we are forgiven by only Jesus’ death and resurrection. Only the Bible, God’s Word, teaches us this wonderful promise. Only in the Scriptures do we hear that we are saved by grace through faith in Jesus Christ. it is the gift of God-- not by works, so that no one can boast (Ephesians 2:8-9).